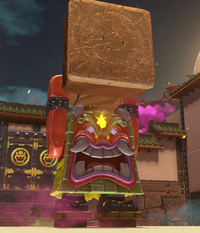 Stairface Ogres are enormous Thwomp-like enemy creatures wielding a stamp-like mallet found predominantly in Bowser's Kingdom within Super Mario Odyssey. They are called the locals of Bowser's Kingdom within the in-game brochure. Their primary means of attack is to smash their mallet down where Mario is standing, which allows Mario to climb up their mallets. Before swinging down their mallets, they telegraph where they are about to attack Mario with a large glowing red square in front of them. Stairface Ogres can be defeated by performing a Ground Pound on top of their head or by poking the yellow gem on their forehead while controlling a Pokio. After a Stairface Ogre is defeated, it makes a wailing sound and explodes. Their faces bear a striking resemblance to those of a Thwomp or Whomp, though they seem to be based off of the mythological oni, which is sometimes seen as a Japanese counterpart to the ogre. Additionally, their manner of attack and defeat is similar to that of a Whomp as well. The mission "Infiltrate Bowser's Castle!" in Bowser's Kingdom specifically requires Mario to defeat a Stairface Ogre to progress. Additionally, Stairface Ogres can be used to break blocks, which is useful for revealing items (if any) inside the blocks. After Bowser is defeated in the Moon Kingdom and the Moon Rock in the Metro Kingdom is activated, Stairface Ogres can be found in a dark secret area known as Pitchblack Mountain accessible via Moon Pipe in New Donk City. "Mallets big enough to climb on." Don't run afoul of the Stairface Ogres that guard this kingdom. When they spot an intruder, they bring their huge mallets down, no questions asked. On the other hand, you have to admire their tenacity and work ethic. The scars on their faces show that they don't give up easily. Donsuke From 「ドンドン」 (dondon), Japanese onomatopoeia for a booming sound; also referred to as 「オニ族」 (oni-zoku, "Oni Tribe") under Locals. This page was last edited on March 24, 2019, at 01:47.